Dorm rooms can sometimes seem, well, too much like a dorm room. With the cramped space and a limited budget, it might seem difficult to make your dorm room really feel like home. A few simple items, however, can really make a difference. Here are four easy and inexpensive ways you can give your dorm room that homey feel. Frames are a great way to add color and texture to bare walls or empty bookshelves. By adding photos of friends and family or art, they can really make your place seem more personal. For cheap frames in any color, go to your local craft store. Many sell wooden frames for only a dollar or two. If you pick up a few cheap paintbrushes and choose a few colors of acrylic paints, you'll have both amazing one of a kind frames as well as a fun crafts night set out for you. Even if you never plan on lighting the candles, just having them there as decor can really add a sense of calmness to the room. Set the candles by your bedside or on your desk to give your room a more homey feel. 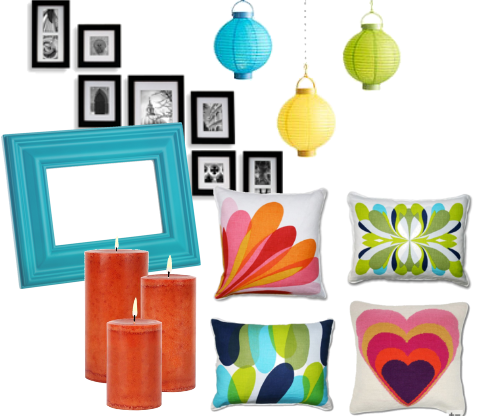 Lanterns can really add both light and color to your dorm room. The soft lighting from the lanterns will illuminate your room without overbearing it. So when you're tired of the fluorescent dorm lights, turn them off and switch to your lanterns and lamps. Pillows are a must for any home and are one of the easiest things you can add to a room to up its decor factor. Pick out a few pillows with designs that you like and throw a few on your bed, one on your desk chair, and a few to toss on any sofa or couch you might have. For these items on a college budget, check out stores like Target and Walmart or designer discount stores like Marshalls and TJ Maxx. Target and Walmart always have cute home items, and stores like Marshalls and TJ Maxx will let you get away with quality goods for a much lower price. What do you think about these decorating ideas?